On this residency at THECUBE, I’ve been interested in how we process emotion: how it is situated within the body, how we recognize it in ourselves and others, and how that recognition can transform us. 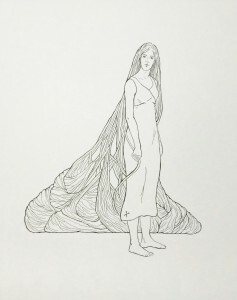 I created this earlier piece, The Girl Who Carries Her Burdens in Her Hair, after my father’s death. 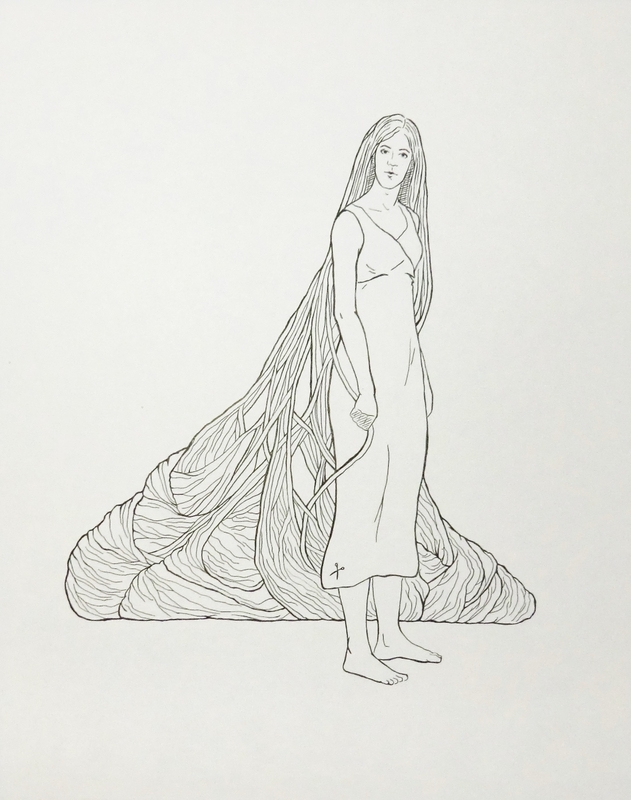 It imagines the story of a girl who loses someone and in grief begins to tuck her sorrows and anxieties into her hair. Over time her hair continues to grow as she continues to tuck her burdens into it, until it becomes an enormous net that drags behind her. This net becomes a central part of her identity – most around her don’t recognize it for what it is. For me, this image is a quite literal representation of the idea of embodied emotion. We understand the world through physicality, through our senses. Many of us can identify with the heaviness of our bodies in grief, have felt our heart pounding with excitement or overwhelmed with love, endured the butterflies of nervous energy before giving a speech. Paying attention to those physical sensations and to our inner reactions helps our minds identify our emotions and helps us understand ourselves and relate to others. The major work I did on the residency moves beyond an imagined embodiment and considers a science-based understanding of our interior emotional structures. 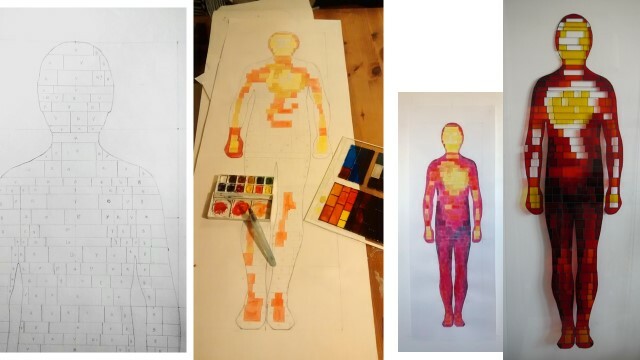 Building the Emotional Body is a series created to represent a study that created bodily maps of emotions – or body sensations associated with different emotions. The study focused on a six “basic” emotions: anger, fear, disgust, happiness, sadness, surprise, and seven “non-basic” emotions: anxiety, love, depression, contempt, pride, shame, envy. Several hundred participants were given prompts to provoke emotional reactions, through words, vignettes or short stories, videos, or images. 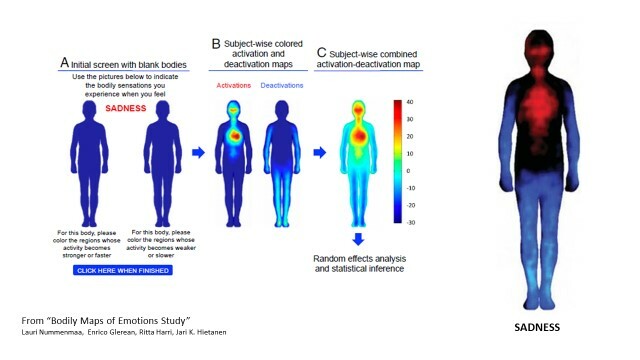 They then self-reported their responses, charting where in the body they felt physical sensory changes by assigning colour to two silhouettes – one for increasing sensation where activity become stronger or faster, and the other decreasing or weaker sensation. What emerged were patterns of activation of specific areas of the body or body parts for distinct emotions – patterns that crossed languages and cultures. The final images looked similar to the above SADNESS – here most active in the active chest, throat and eyes, with the limbs becoming more lifeless. THECUBE’s physical space informed my artistic approach. I wanted to create something that took advantage of the light and glass walls. I was thinking about how transparency relates to emotions, the way they are hidden or exposed by the body or through our own actions. I wanted to hint at our attempts to categorize our emotions or control our responses. But also to truthfully depict the study results. So I began to break down the images into colour blocks – or blocks of sensory activity – and rebuild the bodies in an orderly way, creating a sort of scaffold for distinct emotions. This work fed into my interest in the way we use our awareness of our emotional selves to make meaning of experience through art and story. For THECUBE’s magazine, I looked at artists creating embodied responses to events happening in their lives – work that the rest of us can then emotionally identify with. 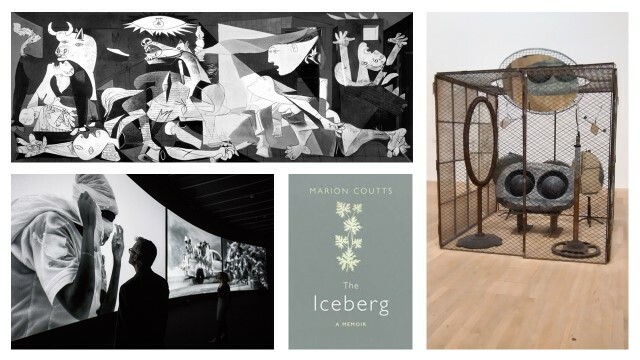 Pablo Picasso struggling with his distress over the massacre in Guernica; Louise Bourgeois working through her personal experiences and pain; Richard Mosse’s response to the current refugee crisis; and artist Marion Coutts writing about losing her husband to a brain tumor. Embodiment – physical sensations related to emotions – helps us to communicate. It helps us to understand ourselves and to relate to others. Both creating and engaging art engages that process. This is where this residency has brought me, and the direction that I’ll continue to take my research into the future.